I was about to complete my online food shop last night when I realised that I had absolutely nothing to snack on in my basket. To the snack section I headed only to be greeted by biscuits, crisps, cereal bars, sweets and chocolate. All very nice indeed, but not so healthy… It was then that I realised that finding healthy (and fulfilling) snacks is actually quite a challenge. I imagine that I’m not the only one who has encountered this problem before and unfortunately, it’s always that 3pm energy slump that has me reaching for the biscuit tin. Well, no more! Introducing a new regular Tigeress Lifestyle feature, Yummy Snack Alert- the best snacks to get you through the day… the healthy way! The first Yummy Snack Alert has to be popcorn. Not just for the movies and actually quite a trend at the moment. Popcorn feels like a sweet treat, but is low in calories and has much less fat than tortilla chips. A light yet satisfying snack and a great alternative to crisps. 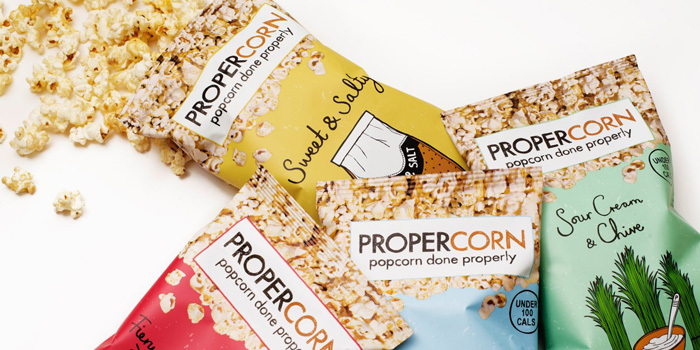 Try Propercorn or Metcalfe’s Skinny Popcorn for a truly healthy selection of flavours including sweet and salted, chocolate, cheese, cinnamon, sour cream, coconut and vanilla, chilly and even wasabi!